This fall has been busy for us, so I thought I’d take the opportunity to share some of our activities and updates with you. 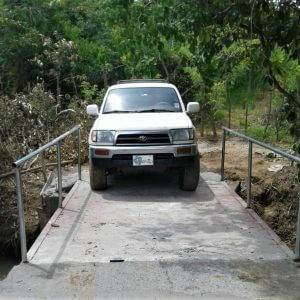 August was the month for getting the bridge built. We can now drive onto the property, saving ourselves an uphill hike to the car after hiking, mapping, and playing on our land. Yippee!! I also took a quick trip to Costa Rica to visit my dad and while I was there two people contacted me about joining the ecovillage. A couple of days after I got back from Costa Rica, September started out with John’s arrival for his initial evaluation period. This is a major life-change for him, as it is for most all of us, and he’s approaching it with a positive attitude and willingness to change. It’s a good thing, too, because I had two back-to-back trips scheduled within 2 weeks of his arrival. The day before my first trip we had an information booth about the project at a local fair by Innovaarte, a group of creative young people who hold a variety of different types of activities and events in our area. It’s wonderful to work with positive and creative people and to share information about permaculture and our ecovillage project. Soon we’ll start a series of workshops and seminars that people have signed up for at the booths we’ve had at Innovaarte’s events this year. Out the door at 4:30am the next day to facilitate a week of training for a socially-conscious wind energy project. Again, tons of positive energy! It was a real pleasure to work with a company whose management team understands the importance of community consultation and engagement. Very often in my career I’ve run into people who you can tell are just paying lip service. Not this company! Everyone was clearly on board with our plan to help them do things well from the beginning. 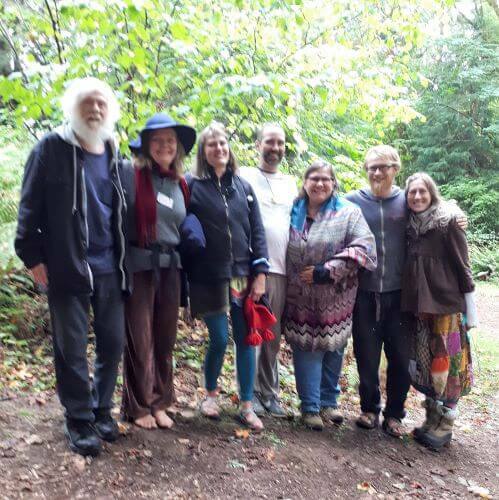 After 2 days home to repack my bags I headed to the US Pacific Northwest to visit old friends and attend the Northwest Permaculture Convergence. This was my first convergence and it was AWESOME! Up until then all my permaculture studies were online as was most of my contact with other ‘permies’. The positive energy of the convergence was contagious and there were tons of incredible workshop sessions. Sometimes it was hard to choose which one to attend, but by immersing in the relaxed atmosphere I always ended up just where I needed to be. The welcoming sense of community and bonding extended to everyone, even this newcomer from Panama who was crazy enough to travel to Washington state for the convergence. What a fantastic experience, I highly recommend it! The comradery and amazing experience of the convergence provided a needed haven since just before traveling I learned of the death of my permaculture mentor, the founder of the Integral Permaculture Academy and our sister ecovillage project 8th Life Canary Islands. Stefania (Stella) Strega Scoz was a marvelous woman, an activist and pioneer and she is sorely missed by those of us who still walk in this world. Just before she left us, we scheduled the first on-site PDC course through the academy to be held here at 8th Life Panama in October & November. More about that in the next issue. Hemos estado bastante ocupados este otoño y pensé tomar esta oportunidad para compartir algunas de nuestras actividades y novedades. Agosto fue el mes de la construcción del Puente. Ahora podemos manejar hasta adentro de la propiedad, ahorrándonos una caminata cuesta arriba después de caminar, mapear y jugar en nuestra tierra. ¡Que chévere! También hice un corto viaje a Costa Rica para visitar a mi papá y mientras estaba ahí dos personas me contactaron acerca de unirse al proyecto. Unos días después de volver de Costa Rica, septiembre comenzó con la llegada de John para su periodo inicial de evaluación. Esto es un gran cambio de vida para él, como lo es para la mayoría de nosotros, y lo está abarcando con una actitud positiva y el deseo de cambiar. Y eso es bueno porque tenía dos viajes seguidos planeados dentro de 2 semanas de su llegada. El día antes de mi primer viaje tuvimos un kiosco informativo en una feria local por Innovaarte, un grupo de jóvenes creativos que llevan a cabo una variedad de actividades y eventos en el área. 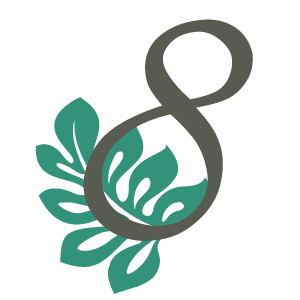 Es maravilloso trabajar con personas positivas y creativas y compartir información acerca de la permacultura y nuestro proyecto de ecoaldea. Pronto comenzaremos una serie de talleres y seminarios a los que se ha apuntado la gente en los kioscos que hemos tenido en los eventos de Innovaarte este año. 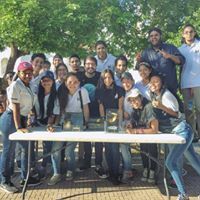 El próximo día partí a las 4:30am para facilitar un taller de una semana para un proyecto eólico socialmente responsable. ¡De nuevo, un montón de energía positiva! Fue un placer trabajar con una empresa cuya gerencia entiende la importancia de la consulta y relacionamiento comunitario. Muchas veces me he encontrado con personas que solamente fingen interés. ¡Esta empresa no! Todo el mundo estaba de acuerdo con nuestro plan para ayudarles a hacer su trabajo bien desde el comienzo. Tras dos días en casa para volver a hacer las maletas, fui al noroeste pacífico de los EEUU para visitar con viejos amigos y asistir al Northwest Permaculture Convergence. ¡Esta fue mi primera convergencia y fue ASOMBROSO! Hasta entonces todos mis estudios de permacultura fueron en línea como también lo fue mi contacto con otros ‘permis’. La energía positiva de la convergencia fue contagiosa y hubo muchas sesiones y talleres. A veces fue difícil escoger entre ellos, pero al sumergirme en el ambiente relajado siempre acabé justo donde tenía que estar. El acogedor sentido de comunidad y unión se extendió a todos, incluso a esta recién llegada de Panamá que estaba lo suficientemente loca como para viajar al estado de Washington para la convergencia. ¡Qué experiencia fantástica, lo recomiendo encarecidamente! La camaradería y experiencia asombrosa de la convergencia proporcionó un refugio necesario ya que justo antes de viajar me enteré de la muerte de mi mentora de permacultura, fundadora de la Academia de Permacultura Integral y el proyecto hermano de la nuestra, 8th Life Canarias. 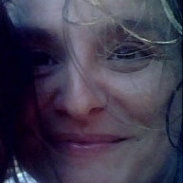 Stefania (Stella) Strega Scoz fue una mujer maravillosa, una activista y pionera y es muy extrañada por nosotros que todavía andamos en este mundo. 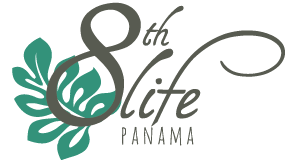 Justo antes de que ella nos dejara, programamos el primer curso de PDC presencial a través de la Academia que se celebrará aquí en 8th Life Panamá en octubre y noviembre. Más acerca de eso en la próxima edición. Te mandamos nuestro amor, Stella.